The upcoming webinar (November 14th, 2018) will be our Winter Indoor Training (Session #2). This session will cover increasing speed (increasing hand speed leading to increasing club head speed leading to increased in ball speed leading to longer golf shots). Exercises to help you increase speed (this webinar covering shoulder (rotator cuff), wrists and forearm). Equipment – importance of a properly fit grip and a grip that is in good condition. Training Aid(s) and Drills – using the Hand Speed Trainers to increase club head speed (guaranteed). As many of you know, we very seldom recommend training aids unless they are directly related to practicing Moe’s single plane swing and to be honest, most of those have been designed and produced by us. From the alignment and ball position trainer to the training grip club to the short game trainer to the perfect impact club, all our training aids have been designed to help you achieve your goals FASTER and MORE EFFICIENTLY. We have always designed our training aids to help all you improve more efficiently and keeping in mind, what will keep all our students on the “right path” during their practice. One issue, we have dealt with since the start is how to create more distance. The answer has always been (and still is) – become more flexible, or at the least, maintain your flexibility and work on your fundamentals to hit the sweet spot on the club on the perfect plane more often. Ideal mechanics with good flexibility will get you maximum distance for your swing. But, what can you do to increase distance? To be honest, we have never had a “great” answer…. until now. Long story made short…. I have a son who plays baseball and works with his traveling team everyday on fielding, pitching and hitting. A couple of practices ago, one of the dads showed me a new training device that his son was wearing to create bat speed. He told me this device was used by many professional athletes and Olympic athletes to create speed. The Hand Speed Trainer™ was developed by US Bobsled Team Member and sports enthusiast Dave Owens. While Dave was traveling, training and competing at sports venues all around the world, he had a vision, a foresight of a training device that was needed but not yet developed to aide in quickness, speed and strength…three key elements that enhance athletic performance. He designed this training device, created it and has now patented the “Hand Speed Trainer™.” The Hand Speed Trainer™, HST™, is like no other. It is a training device that fits securely on your forearm that allows you to accomplish resistance-type training with weights while not restricting any other movement to achieve top athletic performance. It can actually train your body to operate and accept a new level of performance. By keeping the weight closer to the center line of the body an athlete is able to maintain correct body mechanics without altering them. The HST™ allows you to train smarter and maximize your efforts. The Hand Speed Trainer™, now will allow you to functionally strength train by performing work against resistance the right way. It is as critical to train the specific movement as it is to train the muscles involved in that movement. Your brain simply thinks in terms of whole movements not in terms of individual muscles. The exercises with the highest transfer effect are those that are essentially similar to the actual movement or activity of the skill that you want to perform in your sport. For you to get optimal results in your sport repeated practice of the precise movement or skill is absolutely essential. It’s a must. It’s required. Because of the unique Hand Speed Trainer™ weighted system, you as an athlete are able to increase resistance in minimal increments in as little as 4 ounces. This prevents the bio-mechanics of the movements that you are focusing on from being compromised. This allows complete focus for your neuromuscular system to specifically and functionally adapt the memorization of the specific movement needed for you to improve your overall athletic skills. Your body will adapt to the demands that are placed upon it. By wearing the Hand Speed Trainers™ as you repeat sport specific movements such as hitting a golf ball or performing drills you will see incremental improvements quickly. In the past few weeks, Todd and I have used the hand speed trainer and it has shown positive results in increasing hand speed and distance. In fact, results faster than we thought would happen. 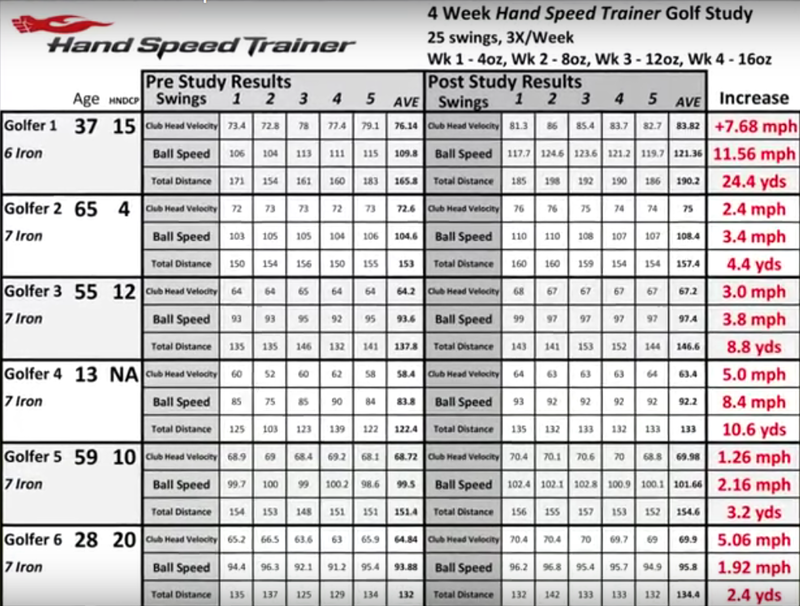 Hand Speed Trainer Effects on Club Head Speed, Ball Speed, Total Distance and Swing Mechanics: Weighted Progression; 25 swings, 3x/Week for 4 weeks (Week 1 – 4oz, Week 2 – 8oz, Week 3 – 12oz, Week 4 – 16oz). PURPOSE: To examine the effects of 4 weeks of weighted resistance training using the Hand Speed Trainer on club head velocity, ball speed and total distance as well as swing mechanics. METHODS: Golfers of varying ages and handicaps wore Hand Speed Trainers for additional resistance while taking twenty-five swings, three times per week. Resistance began at 113.4 g (4 oz.) and increased by 113.4 g (4 oz.) every week for 4 weeks. By week 4 the resistance was 453.6 g (16 oz.). Each golfer (ranging in age from 13 to 61) recorded 5 swings measuring club head velocity, ball speed and total distance before and after the four week testing. RESULTS: Data from 50 swings were collected measuring club head velocity, ball speed and total distance pre and post 4 week Hand Speed Trainer testing. Participants used 6 and 7 irons during data collection. CONCLUSIONS: The data indicates that golfers using the Hand Speed Trainers 3x/week (75 swings) for 4 weeks (300 total swings) achieved an average increase in Club Head Speed (+3.50 MPH), Ball Speed (4.55 MPH) and Total Distance (+7.1 YDS) with their 6 or 7 irons. This correlates to 20 to 25 yards with their drivers.